Before we hit the road with yogic driving, I want to teach you how to meditate. Meditation is a part of yoga that we are going to be applying to driving. 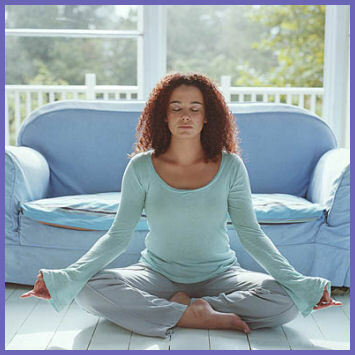 Meditation will teach you how to breathe in a way that will calm the body and clear the mind. Remember my theory: the calmest driver makes the best driver. Yoga references many words in Sanskrit. In the title of this post I refer to the word “Pranayama” which is Sanskrit for “extension of the breath”. In Sanskrit the word “prana” means “life force”, specifically meaning “the breath”. Breathing is how our bodies survive—we draw in oxygen and breathe out carbon dioxide. In Sanskrit, “ayama” means “to draw or extend out”. At the beginning of a meditation practice the breaths are short and brisk, in the middle the breaths are medium length and by the end of the practice the breath will be long and deep. The longer and more drawn out the breath, the calmer driver. A quiet place with no distractions—yes the back seat of your minivan parked in the garage where your kids cannot find you definitely counts! A soft surface to sit on where you can sit up tall with your legs crossed in front of your body—I recommend a pillow to sit atop on your floor. Music (optional)—I highly recommend the Soundscapes Music Channel #743 on the Comcast Cable Network (for more about this see below). Music is a great transitional tool to use to help you sit still when you first start to meditate. Soundscapes is a combination of sounds from nature like waves crashing, thunder, or birds chirping with a peaceful melody played by a pianist, flautist or violinist. I find the combination of sounds from nature and music creates a relaxing background for my meditation practice. Here’s a great way to start using music and meditation together: sit and meditate to just one song. Then work your way up to two. Perhaps you will start to find that you need more than two songs to feel calmer—you want to go deeper. Try three songs and so on! Sit in a comfortable cross-legged position. Take a deep breath in. Straighten your spine by rolling your shoulders down the back, lift your chest towards the sky, keep your chin parallel with the floor and pull your belly button in towards your spine. Do not lie on your back because you might fall asleep. Place the palms of your hands on your knees with palms facing up. Start to breathe in and out. Be present. Be in the moment without thinking of what you did in the yesterday or what you have to do afterwards. Once you feel you’re finished (perhaps after a song or two), stand up and go back to your day. Notice how you feel afterwards. If you felt good today then you will feel good after meditating tomorrow too. Make meditation a part of your daily routine. Keep calm, stay strong and keep driving on! Project Prius C – The Future is Coming! The future is coming. Driving hybrid cars, like my husband’s Prius C, now offer a glimpse of what the future holds—the electric-powered vehicle. Hybrid automobiles also hang onto a part of their past—gasoline-powered vehicles. Think of it this way: Past, Present and Future. The past is represented by gasoline-powered vehicles. These vehicles are so yesterday! Pollution from gasoline-powered vehicles have contributed to today’s global warming crisis. Fifteen years ago, when driving a gasoline-powered vehicle was all the rage, there were one or two hybrid cars being invented and available on the market—specifically, the Toyota Prius and Honda Insight. Today there are so many hybrid versions of some of people’s favorite gasoline powered-cars (like the Toyota Camry, Honda Accord, and Ford Fusion) and SUVs (like the Toyota Highlander, Ford Escape and Chevy Tahoe). Not too worry—the Prius and Insight are still here too! Hybrid vehicles are powered by two engines. One is gas. The other is electric. The driving conditions determine which engine burns energy, which determines the overall carbon footprint of the vehicle. For instance, accelerating and braking quickly and driving at high speeds cause the gasoline engine to have to work more, which means lower miles per gallon and more fill ups. Driving at lower speeds, generally 35mph and lower, along with slower acceleration and braking mean that the vehicle will run off the electric battery as much as possible. The two engines work together recycling energy for the electric battery when the gasoline engine is running. An example of this is slowly coming to a stop—the battery recharges from the energy created from the gasoline engine as you stop. is are cool because they use the battery recharges when you’re braking utilizing braking energy. Recycling energy is what we need right now. But only recycling won’t be enough to cut the mustard going forward. The future is coming! Purely electric powered cars (no SUVs yet) are out there right now and have been available for the last couple of years. There are also cars like the Chevy Volt which feature a mostly electric motor with a very small gasoline engine for backup just in case. Currently, purely electric-powered cars, like the Nissan Leaf, are on the market but are expensive for the size of the car and how far it can go before needing to be recharged. But as the technology gets better, the price will drop and the performance will improve, and the carbon footprint left behind will get smaller. Hopefully, 15 years from now, there will be less hybrids and more cars like the Leaf and Volt on the road, making a carbon footprint that looks like just your big toe touched the sand. And I’d like to see gasoline-powered vehicles in museums and maybe one or two at a local antique car show—and that’s about it! Much like how a hybrid engine works, I’m going to take two things and combine them: yoga practice and my husband’s 2012 Toyota Prius C. I’m going to teach you how yoga can be incorporated it into your driving. My theory is a calmer, balanced driver makes the best driver. And the best driver creates an awesome driving experience. You don’t need to have a hybrid vehicle to follow along with me, although I wish you had one. Heck, I wish I had one and didn’t need to borrow my husband’s. 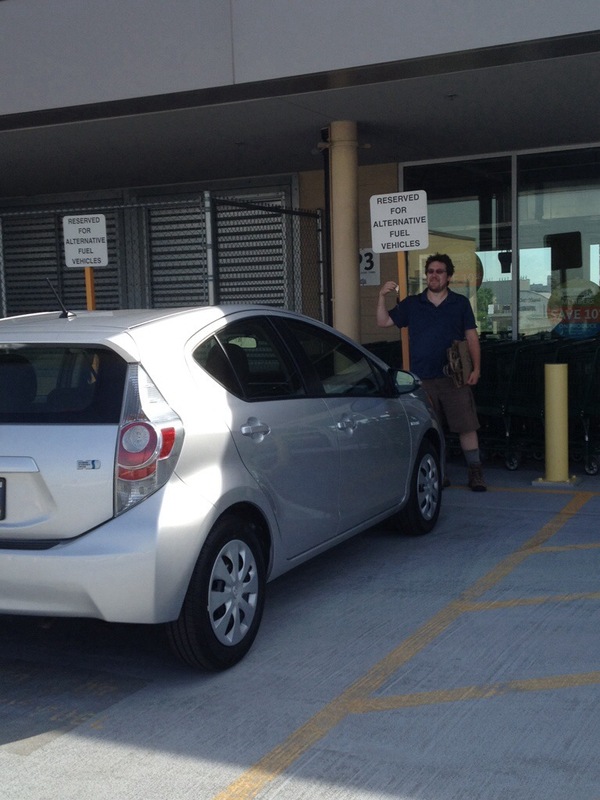 Welcome to Project Prius C—Yogic Driving. The future is coming!